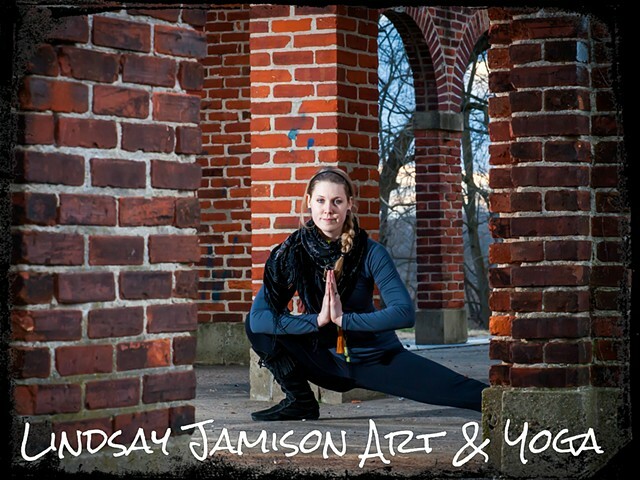 Lindsay Jamison is a visual artist, yoga/mindfulness educator, and yoga therapist in training. Based in Philadelphia, Pennsylvania, she loves traveling, adventure and being immersed in the natural world. Her mission is to make visual art, yoga and mindfulness accessible to heal, inspire, empower and educate our community at large. By exploring the constructs of consciousness with mixed media art, movement and mindfulness practices, she has gained deep insight into how to heal her life and live well in each movement. Currently, she has a private client yoga practice and is facilitating classes and workshops combining yoga, meditation and art. Lindsay also has a studio art practice and shows in galleries, yoga studios and offers Live Painting for nightlife events and festivals. Lindsay specializes in Hatha, Vinyasa, Restorative, Yin, Kids Yoga and Chair yoga as well as Reiki and mindfulness meditation. Her aim is to meet each student where they are to provide a platform of self discovery for positive transformation. She has studied Yoga for Cancer & Chronic Illness (YCAT); Off the Mat, Into the World: A yoga, activism and leadership intensive; 8 week MBSR at UPenn; Kids Yoga Training, Yin Yoga training as well as 400 hours of Inner Fire Yoga training at Yoga on Main in Manayunk. She is currently studying to become a Yoga Therapist at Yoga Life Institute in King of Prussia. She graduated from the University of the Arts in 2009 with a BFA in Sculpture and a strong focus in glassblowing. She studied glass at various schools across the country including Pilchuck, Penland School of Crafts and Pittsburgh glass school. In 2013, Lindsay left the world of glass-blowing to embark on a path of healing, awareness and transformation. Currently, her focus is on teaching yoga and mindfulness as well as creating mandalas and sacred geometry inspired art as a form of investigating the nuances of consciousness and interconnectedness of all things. I have a deep curiosity about humanity’s connection to oneself, our relationship with others and the natural world. Yoga and visual arts are powerful platforms for self inquiry. When I began to learn how to direct my awareness inward, powerful transformations occurred. This journey of self awareness can illuminate old patterns, beliefs structures and ideas that may have been helpful at one point, but are no longer valid. Mindfulness is the practice of paying attention on purpose in the present moment, without judgement. The practices of mindfulness, the ancient science of yoga and visual art have allowed me to change my life in a profoundly positive way. This has inspired me to empower individuals to look inward to see what they can find; to inquire, to feel, to heal and to truly be alive in each and every moment. I aspire to serve my community, to raise consciousness, to build community, to educate, empower and provide a safe space for personal growth.